It is so lovely to be welcoming a new baby and what nicer way to celebrate than to send a hand stamped greeting card? I created this baby card using the Sweet Baby stamp set and matching die set (available as a discounted bundle) from the annual Stampin’ Up! catalogue. The little baby can be stamped and accessorised with headbands, hats and a blanket and if you love to colour this is the perfect card to use your Stampin’ Blends on or Watercolour Pencils. I stamped the little baby girl and die cut her using the matching dies. I decide to added some patterned paper as her baby grow to make it look like fabric. To do this I simply stamped the baby onto a piece of designer series paper and cut around the stamped black line using scissors and glued it in place. I even added a little dimensional pink bow to her hair which I layered a fine coat of fine tip glue to give a glossy effect. The greeting is from the Sweet Baby stamp set and I stamped the inside of the card too with a coordinating greeting and a little bottle stamp! I could not resist adding some texture and dimension to the crumb cake card background which mimics the effect of a quilt and a little stitched edge die cut which is also included in the matching Bouncing baby framelit dies. Of course you could make two, one pink and one blue then your have all your bases covered ready for some lovely news! All the products I have used are available from my online shop. You can visit my shop by clicking the shop now button on my blog. 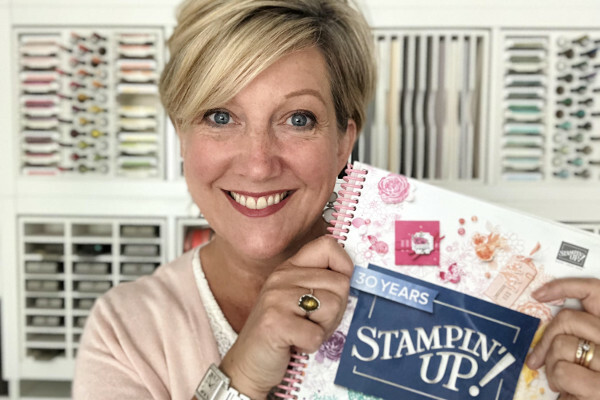 If you have not registered with Stampin Up online before you will need to create a profile and then start adding items to your basket and check out when you are ready. If you spend more than £20 on products please use the monthly hostess code to receive a free thank you gift from me. 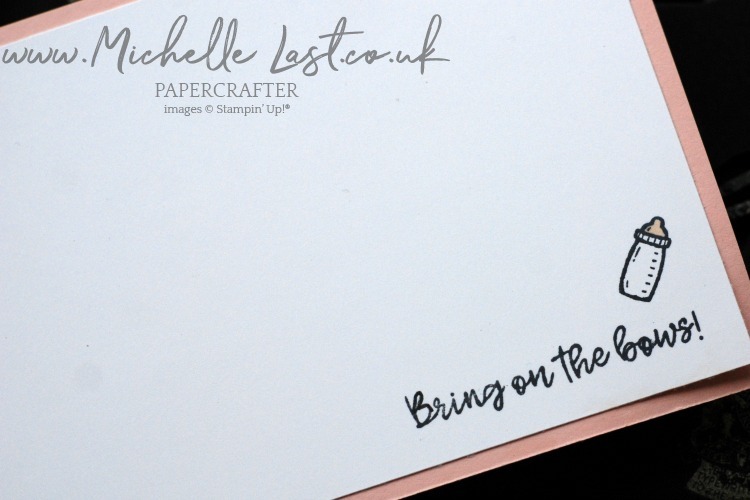 If you spend £150+ (exc postage) please DO NOT use the monthly code as you will receive Stampin’ Rewards to redeem as part of your order (and you will also still receive the thank you gift for shopping with me without needing to add the code). If you need any help please don’t hesitate to get in touch.